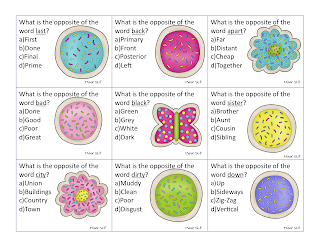 Today I am posting my freebie featuring antonyms. There are 3 different levels to this activity, so I hope you find it useful =D This was a freebie featured in the Speech Spring Blog Hop by 17 wonderful bloggers a little bit ago. If you would like to read about the blog hop and grab the activity from my blog you can check that out HERE. Feel free to bounce through the blog hop if you would still like to grab the freebies even though the contest is over- some of the freebies will be featured here on Speechie Freebies in the next week or so as well.